Tim Bradley (31-1, 12 KOs) will be fighting for the first time since losing his WBO 147lb title when he steps inside the ring to face Argentinian Diego Chaves (23-2, 19 KOs) on December 13th on HBO from the Cosmopolitan of Las Vegas, in Las Vegas, Nevada, USA. Bradley thinks Chaves reminds him a little of Floyd Mayweather Jr with his fighting stance. Chaves doesn’t have the hand speed or the mobility that Mayweather possesses, but he does like to stand in the pocket and use the shoulder roll like him. Bradley’s promoter Bob Arum has matched him up against the 28-year-old Chaves, who has lost 2 out of his last 3 fights. This is a stay busy fight for Bradley, but it could be a tougher fight than some boxing fans expect it to be due to Chaves’ punching power. He’s definitely got the power to make it a tough fight for Bradley if he can get him to stand still long enough for him to drop one of his big bombs on him. It’s hard to predict what Bradley will do in this fight, because he sometimes is willing to slug it out with his opponents. We saw that in Bradley’s last fight against Manny Pacquiao last April with Bradley losing a 12 round decision. However, in Bradley’s fight against Juan Manuel Marquez last year in October, Bradley stayed on the move for much of the fight and was hard to hit. Earlier last year, Bradley chose to trade with Ruslan Provodnikov, and he was almost knocked out in the fight. He ended up taking a lot of punishment but still winning by a 12 round decision. “Chavez is a good fighter. He hasn’t made it to the elite yet, because he hasn’t beaten a good fighter,” Bradley said. “He was in there with Keith Thurman, who is a tough, tough fighter. 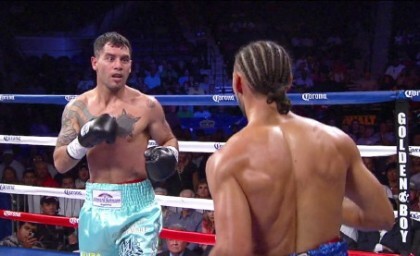 He [Chaves] was doing well until he faded towards the end, and got caught with that body shot. This kid can truly fight. When he fights, he reminds me of a little Floyd Mayweather. He likes to stay in the pocket, roll his shoulders. He’s got a really good right hand, and he throws it with bad intentions. He’s got a good right uppercut like Roberto Duran. He loves to go to the body. He’s always looking for that shot to the body. He’s a true fighter, a real fighter. The world may not know who he is, but the boxing fans know he can fight. I’m expecting a tough fight on December 13th. I know he’s going to be at his best, and I can’t wait to get it on,” Bradley said.